The Autonomous Republic of Nakhchivan was visited between 2 to 5 November 2013 by a high level European Council on International Relations (EUCIR) lead by the Council President-Professor Dr. Anton Caragea. The Autonomous Republic of Nakhchivan is integral part of Republic of Azerbaijan and is favourable placed for economic and political cooperation as is surrounded by Iran, Turkey and Armenia and could become a potential cultural, economic and political hub in the region. The European delegation visit to Autonomous Republic of Nakhchivan was concentrated in analysing economic and tourist facilities, road and communication and to explore the development potential of Autonomous Republic of Nakhchivan and also the cultural and historical patrimony of the outstanding region of Caucasus. Amongst the highlights of the visit was the on the spot trip to the salt mine and health facilities of the Duzdag Health and Therapy Center recommended for treatment of a large area of long diseases. In the amenities area also the delegation lead by Professor Dr. Anton Caragea had visited the markets of the area and the facilities for producing world famous Ordubad art crafts. In the cultural and historical leg of the journey the European delegation had embarked in a tour of city of Nakhchivan, a city with a 3.500 years history, a on the spot excursion to Prophet Noah Tomb, visiting Heydar Aliyev Palace in the city, carpet museum, a cruise to the ancient city of Ordubad, an incursion to the Nakhchivan Shah palace and to Ashabi-Khaf mosque and had observed a classical and opera spectacle offered by the Drama Theatre of Nakhchivan. Among the cultural and archaeological patrimony of Autonomous Republic of Nakhchivan praised by Professor Dr. Anton Caragea where nominated Momina Khatun Shrine and Huseyn Javid House Museum as land marks of a cultural trip to the region. Also ECTT President Anton Caragea had congratulated the Nakhchivan Opera assembly that proved that high quality music and classical entertainment could be provided in any region if there is the will and the resources necessary. Opera of Nakhchivan deserves all the plaudits and is a witness of the genius of Azeri people concluded Professor Dr. Anton Caragea. Taking the advantage of the presence of EUCIR Council President the authorities of the Nakhchivan Republic inaugurated the new facility of Nakhchivan State University. The new university main building is comprised of 25 fully refurbished classes facilities, academic rooms, exhibition corridors and sport and cultural amenities. Also the complex includes buildings for housing students from other areas and international students and professors in residence at Nakhchivan State University. President Anton Caragea tour the facilities, inquired about internet access and medical and food arrangements for professors and students, visited cantina areas and explored the educational rooms and spruced up new buildings of the university. In his inaugural allocution Professor Dr. Anton Caragea express his admiration for the new Nakhchivan State University complex that is meeting international criteria’s for education, health and perfect learning environment wishing full success for the professor and students of the new university and promised that will come back to observe the progresses of the Nakhchivan State University. The visit to Autonomous Republic of Nakhchivan was the first visit of a European cultural delegation dedicated to analyses, assess and promote the cultural potential of this extraordinary region of Azerbaijan. An European Council on International Relations lead by european council president had taken under consideration the academic, cultural and political opportunities offered by tAzerbaijan. Between 30 October to 5 November 2013 a delegation from European Council on International Relations (EUCIR) was invited for an official trip to Azerbaijan and to Autonomous Republic of Nakhchivan in order to analyze academic, cultural and political opportunities offered by this important country in the Caspian Sea Region. Also EUCIR President Anton Caragea attended from 31 October to 1 November 2013 the International Humanitarian Forum held in Baku, a forum that become the world center of cultural and academic elite. The Forum had united, under the leadership of Azerbaijan President-Ilham Aliyev, the highest representatives of academic groups and world leaders from 65 countries in search of solutions to build a world free of economic crisis, wars and conflicts. Upon the invitation of Foreign Minister of Azerbaijan-Elmar Mammadyarov, Professor Dr. Anton Caragea, President of European Council on International Relations (EUCIR) attended as key-note speaker to the forum activities. Azerbaijan President Ilham Aliyev succed in transforming Baku in a gathering point for world elite. Opening the International Humanitarian Forum of Baku, President Ilham Aliyev had underlined the necessity to reorganize international institutions system in order to increase their effectiveness and action power. The purpose of this proposed reform is to empower the decisions of international organisms and to avoid negative cases, like in the situation of Nagorno-Karabakh where United Nations decisions are not implemented for more than two decades and remain dead letter. Azerbaijan President highlighted the necessity to export inter-cultural dialogue model of Azerbaijan, that become a country for many religions and ethnical groups, a country that is respecting equally the Christian, Judaic or Islamic heritage, as part of the global historical patrimony of Azerbaijan. ″We have restored an ancient Zoroastrian temple in Azerbaijan. The oldest church in the Caucasus is also located in Azerbaijan. It has also been renovated. The Shamakhi Juma Mosque, one of the oldest mosques in the world, has been overhauled. It is 1270 years old. In other words, restoration and protection of the monuments of all religions are part of the national policy″, concluded Azeri president. The national Azeri leader mentioned in his speech and the importance of economic development model offered by Azerbaijan in this time of crisis, citing a constant economic growth, low unemployment and high standard of living, with salaries that increased six times in the last decade, all this factors helped Azerbaijan ranking in the top 39 world economic competitiveness. In his allocution, Professor Dr. Anton Caragea, President of European Council on International Relations (EUCIR) had openly thanked President Ilham Aliyev for the initiative to host this high standard forum that has the potential of creating a global world dialogue platform, in order to create a XXI century world without humanitarian crisis, a world of social equity, equal chances and sustainable development. In his key note speech, President Dr. Anton Caragea underlined the fact that the only cure for world economic crisis is a global debate, that will replace the philosophical fundaments of XVIII century, with the imperatives of XXI century: an ecological civilization, relinquishing the capitalist economic paradigm and replacing it with sustainable development and ousting profit as the symbol of global economic assessment and replacing it by social utility. After the forum works where concluded, Professor Dr. Anton Caragea and European Council on International Relations (EUCIR) delegation taken up a tour of city of Baku and a familiarization trip to Autonomous Republic of Nakhchivan, component part of Republic of Azerbaijan. The visit had a strong cultural component including a tour of city of Nakhchivan, a city with a 3.500 years history, a on the spot excursion to Prophet Noah Tomb, visiting Heydar Aliyev Palace in the city, carpet museum, a cruise to the ancient city of Ordubad, an incursion to the Nakhchivan Shah palace and to Ashabi-Khaf mosque and had observed a classical and opera spectacle offered by the Drama Theatre of Nakhchivan. The Baku city tour presented a capital that unites perfectly high tech buildings and the splendours of the old city and had included a visit to Shirvanshah palace, Azeri national television and medieval citadel. President of European Council on International Relations, Professor Dr. Anton Caragea had stated in a television interview for National Azeri Channel that: Baku is today a symbol metropolis that is respecting the past and building a powerful mega polis in line with XXI century requirements and magnificent located on shores of Caspian Sea. The visit to Azerbaijan was held between 30 October and 5 November 2013 and was inscribed in the bilateral expressed desire to develop the strategic partnership and in order to better appreciate the cultural, economic and civilization model offered by Azeri society to European Union. On the occasion of the official visit of H.E. Hoshyar Zebari -Foreign Minister of Iraq to Europe was invited for a working visit to our country and the Minister for International Relations of Kurdistan Regional Government-Falah Mustafa Bakir. On the sideline of this visit, Professor Dr. Anton Caragea, President of European Council on International Relations held a discussion with Minister- Falah Mustafa Bakir regarding the developing of bilateral relations between Europe and Kurdistan in the broader framework of the relation between Europe and Iraq. During the dialogue important topics where tabled, such as: broadening the cultural and academic relations between Europe and Kurdistan, opening special courses to prepare the diplomatic personal from the Regional Kurdistan Government, opening a parliamentary friendship group amongst the two parliaments and also the potential for bilateral economic cooperation was under review. H.E. Minister Falah Mustafa Bakir had underlined the potential of bilateral educational cooperation and marked also the historical similitude’s that are bridging together Europe and Kurdistan as their common fight for democracy and against dictatorship considering this as the necessary base for a continuous development of bilateral relation. H.E. Professor Dr. Anton Caragea, President of European Council on International Relations had convened upon the necessity to boost the bilateral dialogue and express congratulation on the exertions of Minister- Falah Mustafa Bakir in order to promote the correct and positive image of Kurdistan in the world. Professor Dr. Anton Caragea had also underlined the significance of the visit of Minister Hoshyar Zebari for the bilateral connection and warmly appreciated the irreproachable organization of the visit of Minister of Foreign Affairs of Iraq with the support of President Office of European Council on International Relations. The relations between Europe and Iraq are becoming a crucial pillar in the framework of our country diplomatic connections with the Middle East, stated Professor Dr. Anton Caragea. 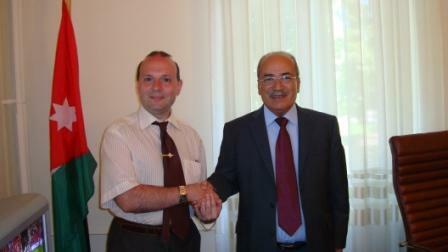 On 5 July 2013 the taking office, protocol meeting, between Prof.Dr.Anton Caragea, President of European Council on International Relations and H.E. Omer Berzinji, Ambassador of Republic of Iraq, had taken place. Prof. Dr. Anton Caragea express his heart felted congratulation on the occasion of beginning of mandate of H.E. Omer Berzinji and stated that Iraq was and it will always be considered a strong ally and friend of Europe in the Middle East region and expressing the view that we have all the unmistakable signs of a successful strategic friendship. In his speech Professor Dr. Anton Caragea had appreciated that between Europe and Iraq we are witnessing a large area of common interests such as: strong, constant developing and stable economic relations, an open and substantial political dialogue and a common sentiment of brotherhood. All this elements are destined to forge a good understanding between the two nations. The European – Iraqi relationship must be an example of constructing strong relation between Europe and Middle East region. In the last decade the bilateral dialogue with Iraq was exceptional in amplitude, seriousness and efficacy and this bilateral long term commitment is constitute an obligation for both of the countries to continue building this framework of dialogue and friendship. H.E. Omer Berzinji had expressed his appreciation for the encouragement`s offered by Prof.Dr.Anton Caragea and had stated that the vision of a economic, politic and cultural special relationship between Europe and Iraq is a mutual shared vision. Iraq is constructing today and open and all inclusive society, based on dialogue and democratic values and also a strong economy that needs European support in technologies, goods and investments, in a win-win relations concluded H.E.Ambassador Omer Berzinji. Concrete actions on increasing European peoples awareness on Iraq continuing development and on economic opportunities, promoting the bilateral relation and especially marking festive the 50 years celebration of bilateral diplomatic relations where discuss and established, transforming the year 2013 in IRAQ IN EUROPE . The amicable discussion marked also an evaluation of present day cultural debates in Islamic world, from the role of democracy and inter-cultural dialogue in Islam and the dialogue between Middle East and Europe where also themes tabled at the meeting. An iraqi carpet is handed out in sign of appreciation for President Dr. Anton Caragea by H.E. Ambassador Omar Berzinji. The dialogue led the foundations of a successful diplomatic mandate and offered the solutions necessary to foster in the near future the relations between Europe and Iraq and constitutes a promise to continue a successful direction of European diplomatic action. A delegation from United Arab Emirates was invited for an official visit to Europe, as a part of the large and sustained efforts from Europe and United Arab Emirates side to further strengthen the bilateral relation and to offer a strategic dimension to the Europe -United Arab Emirates friendship. 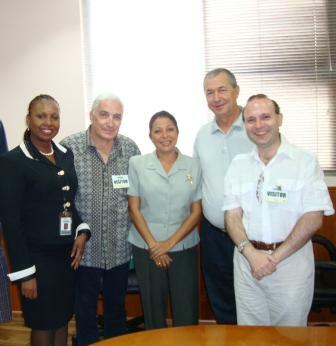 The visit took place between 3 and 4 April 2013. A perfect program was carved for United Arab Emirates delegation, with the support of Professor Dr. Anton Caragea, President of European Council on International Relations, program designed to emphasize clearly the importance of the bond connecting Europe and United Arab Emirates. The UAE delegation was received at the highest level, special discussion being held with the President of Chamber of Deputies – Mr. Valeriu Zgonea and President of Senate-Mr. Crin Antonescu addressed a warm welcoming message to the delegation and entrusted Vice-President of Senate-Mr. Cristian Dumitrescu to express the highly degree of importance and special significance attach by Europe side to the relation with United Arab Emirates. 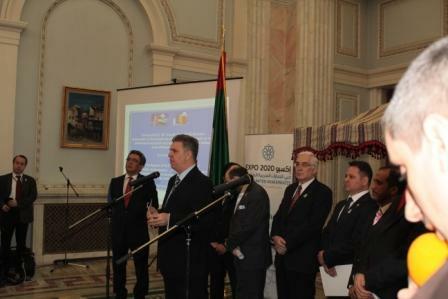 The Chairman of Economic Commission of the Senate, Mr. Lucian Iliescu had clearly marked the European side desire for economic cooperation and increase in the volume of bilateral trade and the support for using Dubai-The Host of WORLD EXPO 2020 as a hub for imports and exports from Europe to enter the Golf Cooperation Council market. In the governmental level discussions, attended by ministers and secretaries of state from Ministries of Tourism, Economy, Business Environment and Future Society, the United Arab Emirates delegation was warmly received and with a clear note of interest in economic exchanges being developed further and with European desire to support Dubai Candidature for WORLD EXPO 2020 and to uphold an extensive political dialogue clearly underlined. Minister of Information Society: Mr. Dan Nica and Professor Dr. Anton Caragea and UAE delegation : UAE Ambassador Yacoub Yousef Al Hosani , Mr. Khalid Almannaei – International Affairs Director UAE , Mr. Abdulla Qassem- World Engagement Director with WORLD EXPO 2020, Mr. Kaabi Hazza – Minister’s Office at Ministry of Foreign Affairs , MAHMOOD AL BASTAKI – CEO of DUBAI TRADE. On 4 of April 2013, the United Arab Emirates delegation was honoured guest in the opening of the European Support Exhibition for Dubai-HOST OF WORLD EXPO 2020. The ample, successfully and perfect organized visit by the highly skilled team of UAE Embassy, lead by Ambassador Yacoub Yousef Al Hosani, was a new chapter in the developing contacts between the two governments, parliaments and peoples and a clear illustration of Europe -United Arab Emirates strong friendship. The end of parliamentary session, in July 2013, had opened the gates to an avalanche of reports and statistics on the legislative performances. The first Romanian Parliament based on one-candidate party list had marked a series of records such as: the biggest number of parliamentary in Romanian history, but also the least productive in terms of pass legislation. There is one field that marked a net positive trend in parliamentary activities: parliamentary diplomacy. The former Parliament, in activity between 2008-2012, had marked a time of political isolation and a refuse of natural role as promoter on international stage of Romanian national image and interests by using the tools of parliamentary diplomacy. In this area the present day legislative had marked an impressive boost in activities. Amongst the parliamentary with the best track record in this area of sensitive and important realm of parliamentary diplomacy we can count in Senate: the county of Iasi representative: Mr. Ionel Agrigoroaei and in the Chamber of Deputies, The Chairman Valeriu Zgonea, Dolj County representative. The Senator Ionel Agrigoroaei had succeeded an impressive activity in this field, being the only Romanian parliamentary, in the last two legislatures, chosen to organize a parliamentary friendship group. This record is related to the Initiative Group for Parliamentary Cooperation between Romania and United Arab Emirates, a group created and leaded by the senator with the support of Institute of International Relations and Economic Cooperation and United Arab Emirates Embassy in Romania. Senator Ionel Agrigoroaei presenting the support for DUBAI- HOST OF WORLD EXPO 2020. The Initiative Group for Parliamentary Cooperation is specially carved entities created to mark the parliamentary dialogue and to support the openings of the parliamentary friendship groups between the two parliaments. United Arab Emirates are the main economic partner of Romania in the Arabic Golf area and a partner for extensive political, diplomatic and cultural dialogue. Unfortunately the bilateral parliamentary cooperation was not at the required level necessary to support such developed relations and the Initiative Group for Parliamentary Cooperation between Romania and United Arab Emirates was designed especially to bridge this gap. Also, Senator Ionel Agrigoroaei was involved in supporting the official visit of a high level delegation from United Arab Emirates in a courtesy call to Romanian Parliament and in organizing the Romanian Exhibition in support of Dubai-Host City for World Expo 2020. 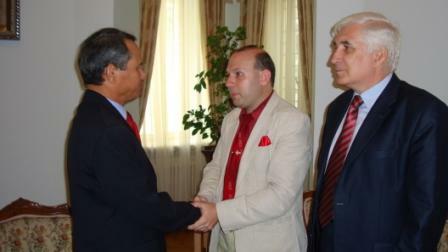 Meanwhile the Senator Ionel Agrigoroaei was the first Romanian senator and political figure to be invited for taking part in a delegation in Laos. Laos is one of the key economic actors in the Indochina Peninsula area, one of the Asian tigers of the region and a country of enormous potential for bilateral cooperation with Romania. 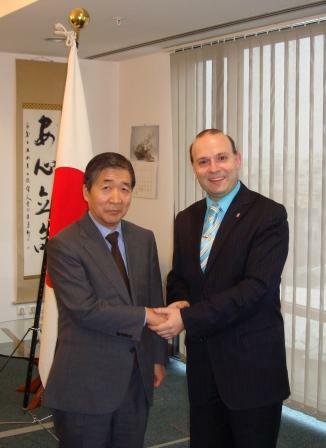 Senator Ionel Agrigoroaei meets the Prime Minister of Laos. The Senator Ionel Agrigoroaei was received by the Laos Prime Minister- Thongsing Thammavong, by Dr. Bosengkham Vongdara-Minister of Tourism and Culture, by Minister of Foreign Affairs and by Mr. Asang Laoly -Vice-Prime Minister of Laos, being the first Romanian parliamentarian that enjoyed such high level access in Laos. Another area that was crucial in the activity of Senator Ionel Agrigoroaei was the relation with Kazakhstan. The Senator has being elected as member of Romania-Kazakhstan Parliamentary Friendship Group. Kazakhstan is the main trading partner of Romania in the region, is the second international investor in Romanian national economy and a strategic partner for Romania in Central Asia. 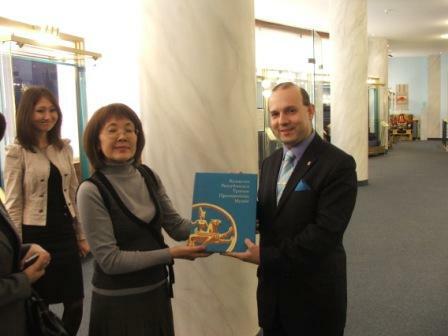 Senator Ionel Agrigoroaei presenting the KAZAKHSTAN 2050 STRATEGY by President Nursultan Nazarbayev. Senator Ionel Agrigoroaei was the only Romanian parliamentarian elected to attend the unveiling of Romanian edition of the KAZAKHSTAN 2050 STRATEGY by Kazakhstan President –Nursultan Nazarbayev. He was also involved in the visit of Kazakhstan parliamentary delegation to Romanian Parliament, the first of a kind in the history of bilateral relation and in organizing the International Conference on Combating World Crisis and on Kazakhstan 2050 Strategy in Romanian Parliament. By this sustained activity and marking a series of records in parliamentary diplomacy the senator Ionel Agrigoroaei leads in the international activity top in this legislative session. Interesting to point out is the fact that: the rich international activity of the senator has not diminished the efficiency of his internal activities, the senator leading also in the statistics on the interpellations addressed to the Prime Minister (8 interpellations) questions (27) and in open speeches (51 presentation). In the Chamber of Deputy, President Valeriu Zgonea had succeeded also a remarkable diplomatic performance. Amongst his strong points in diplomatic activities we can count: the record of being the first Chairman of Chamber of Deputies invited to attend the Astana Economic Forum ( May 2013) the most important international venue to debate world economic problems and select the necessary measures to combat the world economic crisis. Thanks to the activity of Chairman of Chamber of Deputies, for the first time, the voice of Romania could be heard at the stage of this international world forum. Chairman Valeriu Zgonea had also received the honor, grace to his astute diplomatic talent, of being the first leader of Chamber of Deputies invited to inaugurate an exhibition destined to support Dubai candidature to WORLD EXPO 2020. President of Chamber of Deputies-Mr. Valeriu Zgonea outlines the support for DUBAI-HOST OF WORLD EXPO 2020 exhibition. 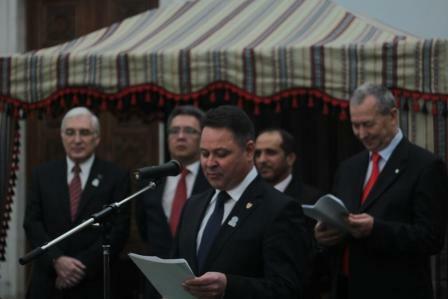 The exhibition to support the Dubai candidature for WORLD EXPO 2020 was the greatest event of this kind in Europe and the presence at his opening of a high level delegation from United Arab Emirates had marked the important role Romania hold, result of his intensive parliamentary activity. The important role of diplomatic diplomacy, lead by deputies leader, Valeriu Zgonea was also underlined by the visit to Romanian Parliament of the high level delegation of Kazakhstan Parliament, the main strategic partner of Romania. 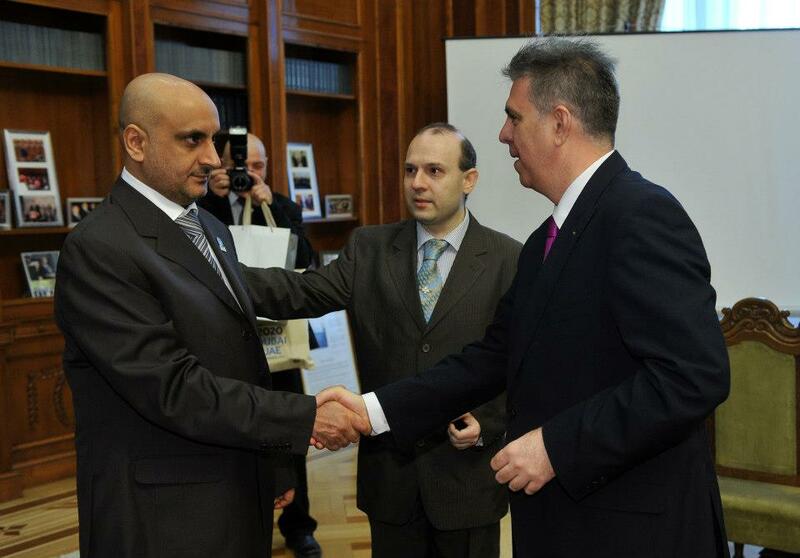 President of Romanian Chamber of Deputies meeting the high level United Arab Emirates delegation. All this remarkable strategic achievements are representing a new face of the Legislature that started his mandate in 9 December 2012: a more dynamic parliament internationally represented and with a good activity at the level of parliamentary diplomacy. Finalul sesiunii parlamentare, in iulie 2013, a dat nastere la nenumarate statistici si evaluari ale performantelor legislativului rezultat in urma alegerilor din decembrie 2012. Primul parlament al Romaniei, bazat pe votul uninominal,a marcat o serie de recorduri precum: cel mai numeros Parlament din istoria Romaniei, dar si cel mai putin productiv in termenii legislatiei aprobate. Intr-un domeniu insa activitatea noului parlament a inregistrat o crestere calitativa neta : diplomatia parlamentara. Fostul parlament, al perioadei 2008-2012, a marcat o izolare politica si un refuz al rolului natural, de promotor al imaginii nationale si al interesului Romaniei pe scena internationala prin diplomatia parlamentara, actualul Parlament a marcat o imbunatatire simtitoare a activitatilor in aceasta zona. Printre parlamentarii ce s-au ilustrat cel mai bine in acest domeniu, important si sensibil, al diplomatiei parlamentare, ii putem enumera la Senat, pe reprezentantul Iasi-ului, Ionel Agrigoroaei si la Camera Deputatilor pe Presedintele Valeriu Zgonea, reprezentantul Dolj-ului. Senatorul Ionel Agrigoroaei a reusit o activitatea impresionanta in acest domeniu, fiind singurul parlamentar roman, din ultimele doua legislaturi, ales sa organizeze un grup parlamentar de prietenie. Este vorba de Grupul de Initiativa pentru Cooperare Parlamentara Romania-Emiratele Arabe Unite, la conducerea caruia a fost ales senatorul de catre Institutul de Relatii Internationale si Cooperare Economica si de catre Ambasada Emiratelor Arabe Unite in Romania. Senatorul Ionel Agrigoroaei prezinta sprijinul pentru DUBAI-CAPITALA EXPOZITIEI MONDIALE 2020. Grupurile de initiativa pentru cooperare parlamentara bilaterala, sunt organisme create special pentru a pune bazele dialogului parlamentar si pentru a realiza constituirea grupurilor parlamentare in cele doua parlamente. Emiratele Arabe Unite sunt principalul partener economic al Romaniei in zona Golfului Arabic, partener de dialog politic, diplomatic si cultural extins. Din nefericire cooperarea parlamentara bilaterala nu era la nivelul dorit si necesar unor asemenea relatii si Grupul de Initiativa pentru Cooperare Parlamentara Romania-Emiratele Arabe Unite a aparut tocmai pentru a remedia aceasta situatie. Totodata, senatorul Ionel Agrigoroaei a fost implicat si in organizarea vizitei oficiale, a primei delegatii la nivel inalt a Emiratelor Arabe Unite la Parlamentul Romaniei si in desfasurarea expozitiei de sprijin a Romaniei pentru orasul Dubai-Oras Candidat la Expozitia Mondiala 2020. Totodata senatorul Ionel Agrigoroaei a fost primul senator si om politic roman invitat, in ultimii douazeci de ani ,sa faca parte dintr-o delegatie in Laos. Senatorul Ionel Agrigoroaei si Primul Ministru al Laos-ului. Laos-ul este unul din principalii actori economici din zona Peninsulei Indochina, unul din tigrii economici ai regiunii si o tara cu un potential enorm pentru cooperarea bilaterala cu Romania. Senatorul Ionel Agrigoroaei a fost primit de Primul Ministru al Laos-ului (Thongsing Thammavong) de Ministrul Turismului si al Culturii-Dr. Bosengkham Vongdara, de Dr. Thongloun Sisoulith -Ministrul Afacerilor Externe si de Dl. Asang Laoly -Vice-Prim Ministrul Laos-ului , fiind primul parlamentar roman ce a beneficiat de un acces de un asemenea nivel in Laos. O alta zona, ce a beneficiat de activitatea senatorului Ionel Agrigoroaei a fost relatia cu Kazahstanul. Senatorul a fost ales in Grupul Parlamentar de Prietenie cu Kazahstanul, tara ce reprezinta principalul partener economic al Romaniei in regiune, al doilea investitor international in economia tarii noastre si un partener strategic pentru Romania in Asia Centrala. Senatorul Ionel Agrigoroaei prezinta lucrarea STRATEGIA KAZAHSTAN 2050 a presedintelui Kazahstan-ului-Nursultan Nazarbayev. Senatorul Ionel Agrigoroaei a fost singurul parlamentar roman ales sa participe la prezentarea editiei, in limba romana, a lucrarii :Strategia Kazahstan 2050 a Presedintelui Kazahstanului-Nursultan Nazarbayev. A fost de asemenea implicat in vizita delegatiei parlamentare din Kazahstan la Parlamentul Romaniei, prima de acest fel in istoria relatiei bilaterale si in organizarea Conferintei Internationale Combaterea Crizei Economice Mondiale si Strategia Kazahstan 2050, la Parlamentul Romaniei. Prin aceasta activitate sustinuta si marcand o serie de recorduri pentru diplomatia parlamentara, senatorul Ionel Agrigoroaei conduce detasat in topul activitatilor parlamentare internationale in acesta legislatura. Interesant este ca, bogata activitate internationala a senatorului nu a diminuat interesul sau pentru activitatile interne, senatorul conducand detasat in aceasta legislatura si in domeniul interpelarilor adresate Primului Ministru ( in numar de opt) si al intrebarilor ( 27 la numar) si al luarilor de cuvant (51 de prezentari). La Camera Deputatilor, Presedintele Valeriu Zgonea a reusit o performanta diplomatica remarcabila. Intre punctele forte ale activitatii sale diplomatice putem enumera performanta de a fi primul Presedinte al Camerei Deputatilor invitat sa participe la Forumul Economic de la Astana ( mai 2013), cel mai important forum international de dezbatere a problemelor economiei mondiale si a masurilor necesare pentru combaterea crizei economice actuale. Presedintele Camerei Deputatilor-Valeriu Zgonea deschizand Expozitia de sprijin pentru Dubai-CAPITALA EXPOZITIEI MONDIALE 2020. Multumita activitatii Presedintelui Camerei Deputatilor, pentru prima data, vocea Romaniei s-a putut auzi de la tribuna acestui inalt forum. Presedintele Valeriu Zgonea avut onoarea, gratie talentului sau diplomatic, de a fi primul lider al Camerei Deputatilor invitat sa inaugureze un vernisaj dedicat unui oras candidat la Expozitia Mondiala 2020 : Dubai-ul. Expozitia de sustinere a candidaturii orasului Dubai pentru WORLDEXPO 2020 a fost cea mai mare din intreaga Europa si prezenta la deschiderea ei a unei delegatii la nivel inalt, a Emiratelor Arabe Unite, arata rolul important al Romaniei, gratie activitatii sale parlamentare intense. Rolul important al diplomatiei parlamentare, conduse de liderul deputatilor, Valeriu Zgonea, trebuie marcat si prin vizita la Parlamentul Romaniei a delegatiei la nivel inalt a Parlamentului din Kazahstan, principalul partener strategic al Romaniei. Presedintele Camerei Deputatilor primeste delegatia la nivel inalt din Emiratele Arabe Unite. Toate acestea realizari diplomatice remarcabile, arata si o noua fateta a legislativului ce si-a inceput mandatul in 9 decembrie 2012 : un parlament mai dinamic, prezent international si cu o buna activitatea la nivelul diplomatiei parlamentare. EUROPEAN DELEGATION VISIT TO KAZAKHSTAN. A STRATEGIC PARTNERSHIP RECONFIRMED. European Council on International Relations delegation, headed by Professor dr. Anton Caragea, President of European Council on International Relations was invited for an official working visit to Republic of Kazakhstan between 19-25 November 2012. The high level European delegation has being invited to visit Astana-capital of the Kazakhstan and Aktau city –main center of the Kazakhstan on the sea tourism program. The main objective of the visit was to convey the message of friendship and the desire of the European side to strengthen the bilateral cooperation with Kazakhstan in the areas of economy, culture and mass media. The Kazakhstan side had expressed his interest in the further development of the bilateral relations with Europe and the desire to fulfill the basic principles of the strategic relations forged between Europe and Kazakhstan. The European delegation headed by Professor Dr. Anton Caragea held meetings with President of Kazakhstan Trade and Industrial Chamber Mr. Tabyr Esembekov. During this meeting was presented the opening of European -Kazakhstan Business Council and the parties decided on the opening of the Kazakhstan counterpart to European based Business Council, also where tabled the main topics of the bilateral economic agenda and decided on the visit to Europe of a delegation of Kazakhstan business leaders in February 2013 and the was decided upon helding the European –Kazakhstan Business Forum during the visit of H.E. President Nursultan Nazarbayev to Europe . Professor dr. Anton Caragea held discussion with Mr. K. Burkhanov, Deputy of the Parliament of the Republic of Kazakhstan who welcomed the visit of the European delegation as a landmark visit in the development of the bilateral relations. Mr. K. Burkhanov expressed also his appreciation for the European parliament role in the development of political relations between Europe and Kazakhstan. The European delegation also held meetings at the Talgo Factory, destined to be the first factory of locomotives in Central Asia and open discussion at the Ministry of New Technologies and Trade and at National Investment Company of Kazakhstan. In the cultural part of the program, carved by Kazakhstan authorities, for the European delegation in the city of Aktau , professor dr. Anton Caragea visited State University of Aktau and the famous historical and religious site of Shakpak Ata. During his visit to State University of Aktau, professor dr. Anton Caragea and European side held talks with European professor`s working there on common educational programs and meet the Rector of the University-Dr. Abzhapparov Abdumutalip. Professor dr. Anton Caragea appreciated the European role in establishing joint educational program at Aktau University and express his proud that European side had constructed with Kazakhstan support a perfect model of educational institution. Rector of Aktau University- Abzhapparov Abdumutalip asked for European support in having more professors for finance, economy, engineering and other areas stating that European professors are among the best in the world. Than European delegation visited museums and cultural and touristic objectives in Aktau area , the main being the sacred place of Shakapak Ata, a special historical and religious significance sanctuary for people of Kazakhstan. On 5 July 2012 at the residence of Bolivarian Republic of Venezuela Embassy a special reception destined to mark the National Day of Venezuela was hosted. The reception had gather representatives of diplomatic corp accredited to Europe, mass media and a delegation of European Council on International Relations headed by professor dr.Anton Caragea. Professor Dr. Anton Caragea, President of European Council on International Relations had warmly appreciated the efforts of Venezuelan Embassy in Europe under the mandate of H.E Z. Coromoto Prieto de Rodriguez to make known to European public the ideals of Bolivar and Bolivarian revolution and the plight of Latin America and appreciated that 5 July is a turning point and an important date for any European freedom and dignity loving. 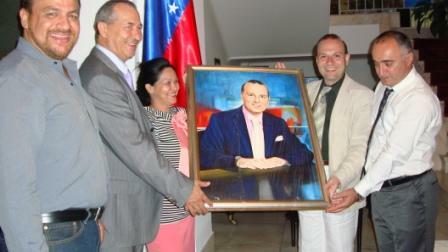 Also professor dr.Anton Caragea express his appreciation for receiving a new Venezuelan art piece as a sign of European-Venezuela excellent relations. The 5 of July Venezuela reception was highly praised by everyone present for the extraordinary amicable atmosphere. KAZAKHSTAN HOSTS RECEPTION TO HONOR THE STRATEGIC RELATION WITH EUROPE. On 12 of July 2012 the Embassy of Republic of Kazakhstan had organized a public reception to celebrate the landmark of 20 years anniversary of diplomatic relations between Europe and Kazakhstan. The celebration was attended by intellectuals, public figures, business community leaders, clergy and high level political personalities come to present homage to the strategic relation between Europe and Kazakhstan. In only 20 years from establishing diplomatic relations Kazakhstan had rapidly become the main trading, economic and political partner for Europe and the Central Asian region. Amongst the main highlights of this strategic relation we can present: European support for Kazakhstan chairmanship of OSCE in 2010, the European support for Astana`s bid as organizer of EXPO 2017 and the gigantesque conference held on 23 may 2012 when the European academic and diplomatic elite had express publicly the support for the strategic partnership between Europe and Kazakhstan. All this important landmarks where presented in the framework of July 12 receptions, reception perfect organized by the Kazakhstan Charge D`Affairs- Talgat Kaliyev in an amicable and warm atmosphere. 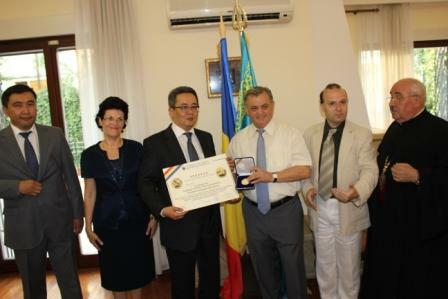 A testimonial of the feelings of admiration and high standing of Kazakhstan in Europe was the presentation (at the indication of Professor Dr. Anton Caragea, Director of Institute of International Relations and economic Cooperation) by Mayor Nicolae Ontanu, on behalf of people of Bucharest of the main municipality honor, the medal SUPPORTER OF HUMANITY for H.E. President of Kazakhstan –Nursultan Nazarbaev. This is a new indication that Europe-Kazakhstan relations are based furthermore on admiration and friendship among our nations appreciated professor dr.Anton Caragea. In the end of this special night of friendship H.E. Kazakhstan Charge D`Affairs Talgat Kaliyev received warm congratulation from the attending participants for a perfect reception and a key moment in expressing European-Kazakhstan long term commitment for a strategic partnership. - Promoting a new concept of community based tourism, friendly to nature, with low ecological impact and preservation of natural biodiversity and protection of endangered species and areas, especially rainforest eco-climate. - Offering to tourists not only a historical and outstanding cultural experience but also the possibility to explore nature , to contribute to ecological preservation and the opportunity to visit extraordinary space such as: Nam Ngum reservoir , Bolaven plateau, Mekong river islands , Mekong river boat trip , Tad Kouangsi waterfall , the cave of de Ting . - The continuous development and protection of cultural and historical patrimony of Peoples Democratic Republic of LAO, the transformation of Vientiane in a historical and spiritual center offering to the visitor a glimpse into rich culture and heritage of peoples of Lao . - The preservation of an outstanding historical and cultural patrimony that comprises wonderful sites such as: Wat Phu- a UNESCO World Heritage Site from 12th century, the remarkable site from Plain of Jars, offering an insight into Neolithic civilization and a rare window into traditions of centuries The preservation of religious sites of world significance and value such as: Wat Xieng Thong, one of the most important of world Buddhism monasteries and remains a significant place for the spirit of religion and traditional art. Other sites that must be mentioned such as: Wat Phu ( UNESCO heritage site) and Champasak Cultural Landscape ( under UNESCO recognition). - Keeping alive spiritual tradition, integrating tourist`s and visitors in the atmosphere of the Lao people, offering possibility for an enriching cultural experience, are all achievements that transform Peoples Democratic Republic of LAO in a spiritual destination of first hand. European Council on International Relations has being voted as the BEST EUROPEAN THINK TANK AND INTERNATIONAL ORGANIZATION at the Bucharest meeting of european international relations and diplomatic experts from across European Union. The meeting hosted by Ecological Institute of Romania and Justice and Law Institute of Romania discuss the evolution in international law`s and justice, the reform of European Law, European Court of Justice and Rome Treaty. On the conference the international visitors discuss also the impact of international think tank role in XXI Century world in offering alternative views to official point` s, offering targeted analyses and evaluation and offering assistance to governments and ministries across the world. Also the think thanks are offering new possibilities to public diplomacy, that is extensively becoming the most important area of diplomacy as the nations states opportunities for diplomatic activities are shrinking . The participants voted EUROPEAN COUNCIL ON INTERNATIONAL RELATIONS as BEST EUROPEAN INTERNATIONAL ORGANIZATION AND THINK TANK and a peerless model for European public diplomacy. In 2011 European Council on International Relations offered breaking analysis on areas such as Syria, Middle East, and Central Asia etc. established diplomatic links to important countries such as Tajikistan, Kazakhstan, Turkmenistan, Algeria, Morocco, Venezuela, Argentine and Brazil. Also EUROPEAN COUNCIL ON INTERNATIONAL RELATIONS created in parlous condition monitoring missions, supported democracy worldwide, offered priceless training in diplomacy, international relations and elections organizing and monitoring. 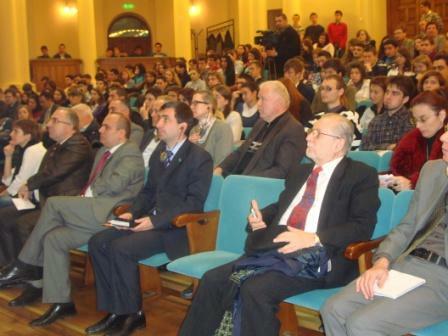 The extensively and unremitting exertions for the public good of EUROPEAN COUNCIL ON INTERNATIONAL RELATIONS offered to European Union an opportunity to express his values, to assert his unity and to offer a world model for public diplomacy , considered the participants at International Law and Justice Seminary. 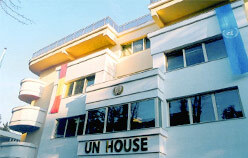 On 13 December 2011 on United Nations Headquarters in Romania was unveiled the special initiative on protecting natural areas of United Nations Development Program ( UNDP) . On this occasion Professor Dr. Anton Caragea was presented with the appointment of Goodwill Ambassador At Large for the World Natural Protected Area. Professor Dr. Anton Caragea was empowered to speak on behalf the ecological and protection program`s regarding protected natural area and to represent on world stage the necessity issues related to: integrating environment into development , environment and finance, local development, climate change, sustainable energy, ecosystems and biodiversity, ozone and climate , climate strategy etc. 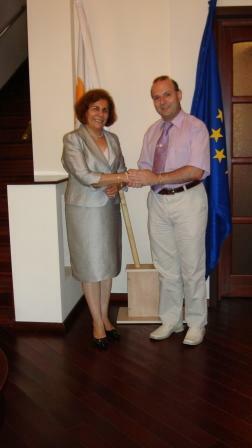 In his acceptance speech as Goodwill Ambassador for Natural Protected Area Professor Dr. Anton Caragea had appreciated the wealth of Romanian natural protected area evaluated at more than 23 natural and national parks that are representing a priority for natural conservation in Romania and for the world. This regions will be a priority for me and also we have to emphasize the educational vision in promoting natural area protection and development, touristic opportunities, conservationist education programs and international aid. All this all the pillars of developing and insuring financial independence and sustainability for natural protected areas, concluded professor dr. Anton Caragea. The discussion concluded with the UNDP Country Representative presentation of the UNDP plans main features: The natural environment is the foundation on which poverty reduction efforts and sustainable development must be built. Poor people everywhere depend critically on environmental assets and energy resources for their livelihoods and well-being. It is widely recognized that recent and ongoing global shocks, food, fuel, financial, climate change, have linkages, if not in some cases direct lineage, to environmental issues related to the use and management environmental systems and services. Therefore, mainstreaming environment and sustainable development, including climate change, in national development planning and implementation is central to UNDP`s poverty reduction and Millennium Development Goal mission.